If you’ve watched talent shows before you probably know that judges are like gods and they decide what’s good and what isn’t. The same goes for this new and amazing online video slot from Red Rake. Judges Rule the Show is a fun five reels, three rows and 30 paylines video slot that will make you love the judges because they come with big wins. Apart from the lovely graphics and sound effects there are many bonus features to look forward too and if you get the judges’ favour you are going to be a real winner. 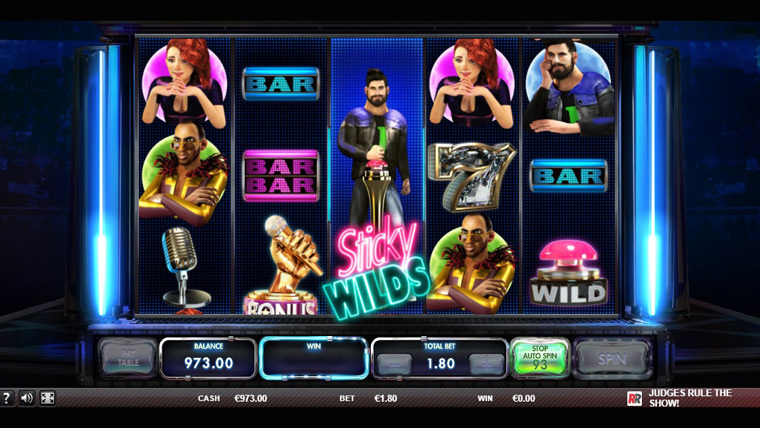 Wild – it has the power to substitute all symbols except for the scatter and bonus icons in order to form winning combinations. Bonus – bonus symbols can appear on the second, third and fourth reels. If you land three of a kind you will trigger the free spins bonus feature where you receive ten free spins. Sticky Wilds Re-spin – the Sticky Wilds Judges Re-spin is triggered when a Special Judge symbol appears on the centre reel. This will trigger a re-spin. After this every time a regular judge symbol of the same judge appears he/she will become a sticky wild and launch another re-spin. The feature goes long as long as judges still appear. Judges rule the show – during the free spins bonus feature, the judges rule the show feature grows and transforms all regular judges into sticky wilds, thus bringing bigger wins. The bonus features are quite interesting and paired with a 95.3% RTP they can bring you some serious wins.